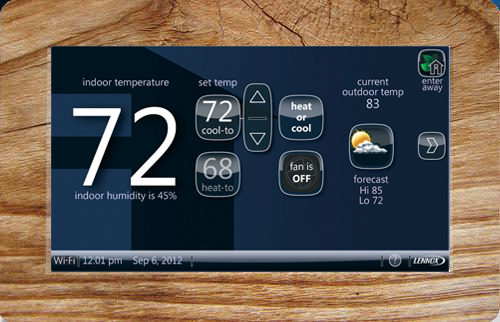 The iComfort thermostat comes with some awesome features that make it stand out from the crowd. Unfortunately,additional accessories are needed to make it compatible outside the Lennox Premier systems. Lennox took a unique approach by partnering with Gelaskins for a truly personalized experience. The weather forecast and large responsive touchscreen makes the iComfort Wifi Thermostat a great buy to compliment your Lennox System. 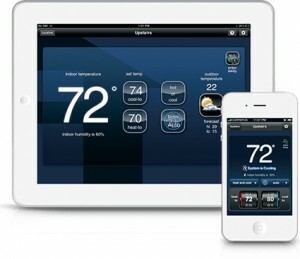 The Lennox iComfort wifi thermostat is made specifically for the Lennox Signature series equipment. In most cases, they can only be purchased and installed by a local Lennox authorized dealer. If you feel comfortable doing the install, Amazon is one place to find them for sale. Additional equipment is needed to make the iComfort compatible with non-Lennox systems. 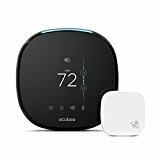 You’ll probably find it cheaper online, but I highly recommend doing a professional install since it’s not your average wireless thermostat. The iComfort interface is by far the slickest I’ve seen. You can tell Lennox wanted to provide a great user experience. The touchscreen is very snappy. The large screen makes it less congested so tapping on buttons isn’t a precise task. The real-estate is handy for displaying easy to read font and just the right amount of information. The user interface is very intuitive and flowing. 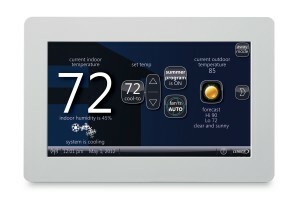 Controls allow for adjusting temperature, humidity, and fan speed. 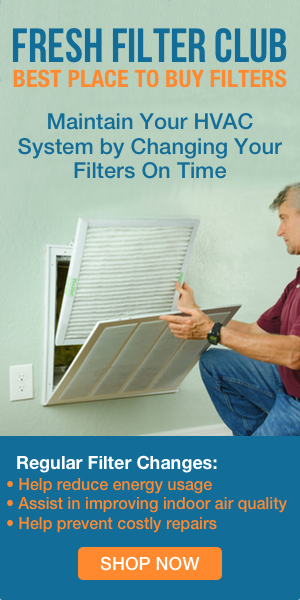 iComfort also provide notifications to alert if the filter needs changing as well as other maintenance reminders. When a device becomes connected to the wonderful thing we call the internet of things, it allows you to make changes from anywhere. The Lennox iComfort wireless thermostat brings energy efficiency to your pocket. Staying late at the office, last minute date night, staying an extra day on that awesome? Just open the iPhone or Android app, or any web enabled device, and adjust your homes temperature to suit the change in schedule. It’s also a peace of mind to check up on your homes status to make sure the air conditioning or heating is working properly. An awesome feature that many wireless thermostats lack is a 7-day forecast. It’s handy to get a glance of the week with a simple tap on the way for a morning cup of coffee. If you really want a custom look, Lennox has partnered with Gelaskins. 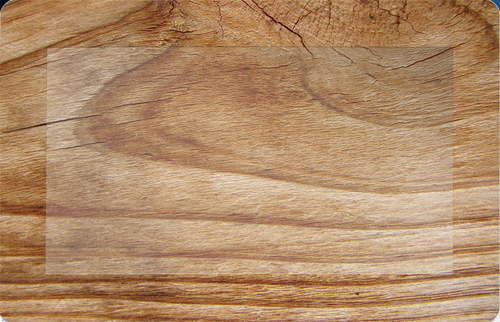 You can order a printed slicker for the frame that matches the walls texture, wood walls look cool, and assign it to the wallpaper so it really blends in.